Amelia Baker was born in Minnesota in December 1887. Her parents, either biological or foster parents (it’s not clear) were Alfred George Baker and Mary Ann Baker. Alfred was born in England in the 1840s. He immigrated to America around 1860 and fought in the Civil War on the Union side, serving in the 61st New York Infantry. He came to Duluth around 1880 and worked for years as a marine engineer. Mary Ann was born in Ireland about 1862. She came to America in 1874. She and Alfred lived in Duluth at 2209 Minnesota Avenue on Park Point. 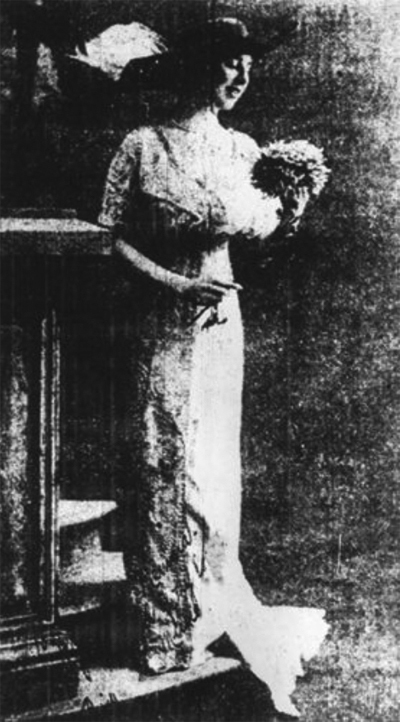 Millie returned to Duluth for a visit during the Christmas season of 1914. She left Duluth on January 3, 1915, for New York, where she studied with Madame Giulia Valda for a few months. She left New York on May 1, 1915, aboard the Lusitania to return to Paris for a resumption of her studies with de Trabadelo. Millie was traveling with art dealer and connoisseur C. F. Williamson, their cabins across the hall from one another. It was later revealed that they were to announce their engagement in the fall. The ship was sunk by a German U-boat on May 7, 1915, off the coast of Ireland, and Millie died in the tragedy. She had been expected to make her debut in grand opera shortly in Paris.